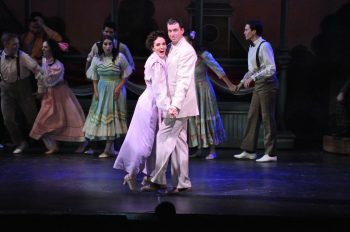 The other night I paid my first visit to the Reagle Music Theatre of Greater Boston, and I was pleasantly surprised by what I saw. The Reagle stages productions of Broadway Musicals at the Robinson Theatre located in Waltham High School. Don’t be fooled by the location. The auditorium is a great venue with comfortable seats and a great view no matter where you are seated. More than that, the play I saw was a top notch production that included a full orchestra, something you rarely see today in regional theatre. That full orchestra really makes a difference and was extremely impressive. The production currently playing at the Reagle is Meredith Willson’s The Music Man, one of, if not the, best musicals ever written. It is certainly a favorite of mine and I was skeptical that this would rate very high in quality. My doubts were soon chased away once the orchestra began playing the overture which led into the opening number, the onomatopoeic Rock Island, which takes place on a train. This train left the station and the audience was in for a wonderful ride to River City along with Professor Harold Hill, the flim flam man who would eventually be won over by the Iowa Stubborn folks he was trying to take with his scam about starting a boy’s band. Mark Linehan, in his seventh production at the Reagle, had his work cut out for him in the role of Hill. Most audience members know Hill from the movie version of the play and have Robert Preston’s version burned into their memories. Mr. Linehan does not attempt an impression of Preston, but instead gives his own interpretation of the smooth talking traveling salesman. It doesn’t take long to embrace Linehan’s Hill and to appreciate what he does with the role. Ya Got Trouble, The Sadder But Wiser Girl, and the rousing Seventy-Six Trombones are all classic Broadway musical numbers that Linehan delivers right on the mark. It is also quite the treat to see Jennifer Ellis as Marion Paroo, the librarian with a heart like a lump of lead as cold as steel, but who eventually finds her way to allowing that heart to melt and opens her eyes to seeking her white knight. Ms Ellis puts her heart as well as her beautiful voice into Willson’s warm and touching numbers Goodnight My Someone, My White Night, Will I Ever Tell You, and Till There Was You. Was there ever a better score than this? I don’t believe so, and Jennifer Ellis was born to sing these amazing songs. 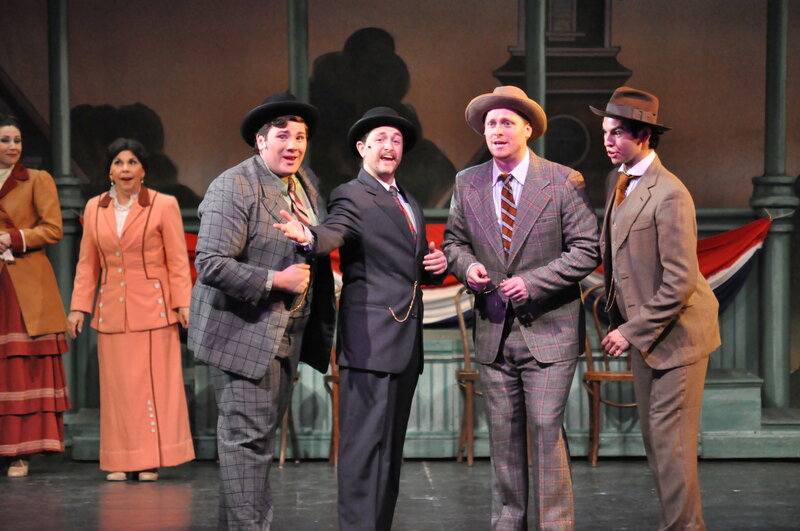 The Music Man has a huge cast and you might think a small company would pare it down a bit, but the Reagle does not. Director and choreographer Susan M. Chebookian goes all out to give a full scale production here. Using choreography based on the original by Onna White, the huge dance numbers in Seventy-Six Trombones and Shipoopi are a site to behold. Watching and listening to The Wells Fargo Wagon gives you the feeling of excitement the residents of River City have while waiting for the approaching delivery. 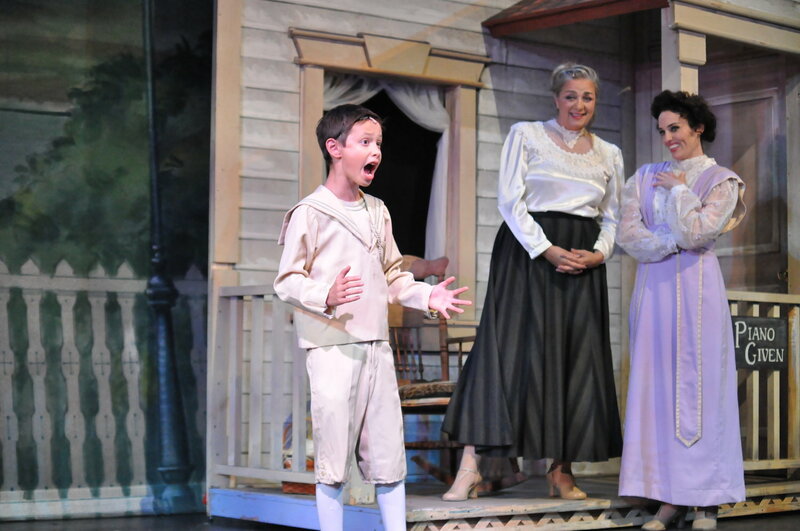 Ms Ellis and Mr. Linehan are superb, and they are backed up by a strong cast including Harold “Jerry” Walker as Mayor Shinn and Lori L’Italien as his wife Eulalie Mackecknie Shinn. Both have wonderful comedic timing and both are able to push their characters to the edge without crossing into caricature. They are real pros. 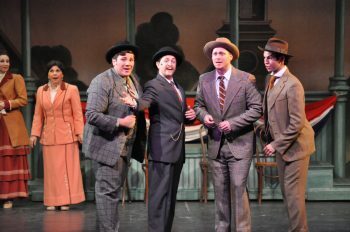 Shipoopi is a number that is sometimes knocked as not fitting into the play, but when you see see Daniel Forest Sullivan as Marcellus Washburn lead the cast in this more than lively number you won’t be able to imagine it not being included. Sullivan really kicks in on it. Oh, such a large and wonderful cast. The School Board comprised of Louis Brogna, Matthew Gorgone, Antonino Ruggeri, and Tom Sawyer keep perfect harmony in their barbershop quartet numbers. Singing in counterpoint with Ms Ellis on Lida Rose/ Will I Ever Tell You it is a feast for the ears. Jonathan Tillen, Marylee Fairbanks, and Jennifer Ellis “Gary Indiana. 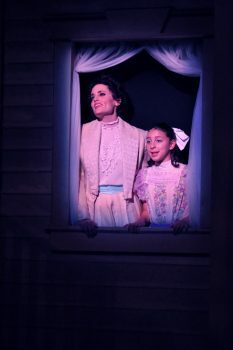 I’ve always felt that the Mrs Paroo must be a dream role, and Marylee Fairbanks makes that dream come true as the mother of Winthrop and Marion. Strong and kind with her Irish determination and heart of gold. Ms Fairbanks’s Paroo has the twinkle in her eye and just enough skills at manipulation to push her daughter in the right direction. Perhaps the real stars of this production are the children and young adults who worked endless hours preparing for their moments on the stage. Jonathan Tillen as the withdrawn Winthrop Paroo shows us the growth of the self conscious young boy with a lisp who has sunk into despair since the death of his father but now begins to find himself through Professor Hill. In both The Wells Fargo Wagon and Gary, Indiana we see him emerge and you can’t help but feel touched by young Tillen’s performance. Winthrop’s friend Amaryllis who prays for him every night is played by Cate Galante. Cate’s Amaryllis is full of life and love. Her feelings for Winthrop warm the heart. She sparkles on stage. Ye gods! I can’t forget Isabelle Miller who takes on the role of Zaneeta Shinn, the Mayor’s daughter. Zanneta is quite taken with bad boy Tommy Djilas played by Bernie Baldassaro who saves the day, and Professor Hill’s neck, by putting a band together. Both performers are vibrant and interact well together. The ensemble is large and in sync. It is quite something to see how they light up the stage in Waltham. Their energy is boundless. 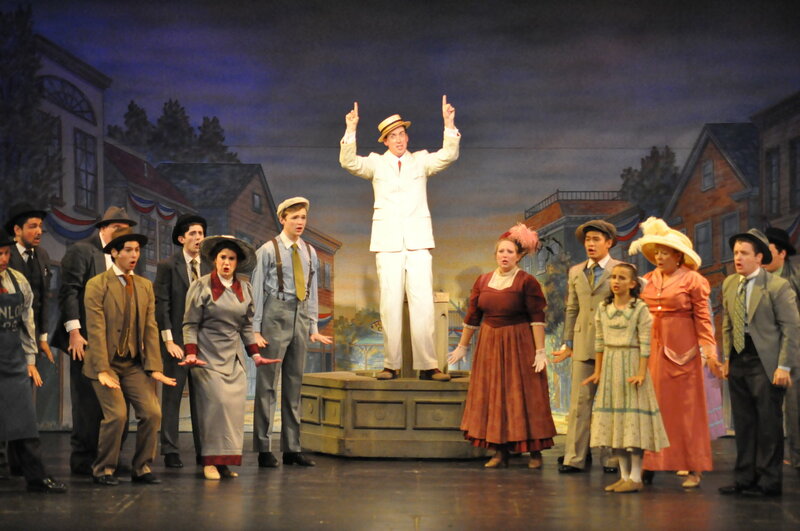 The Music Man has a short run at the Reagle in Waltham so you should plan on getting there soon. You don’t want to miss this one. 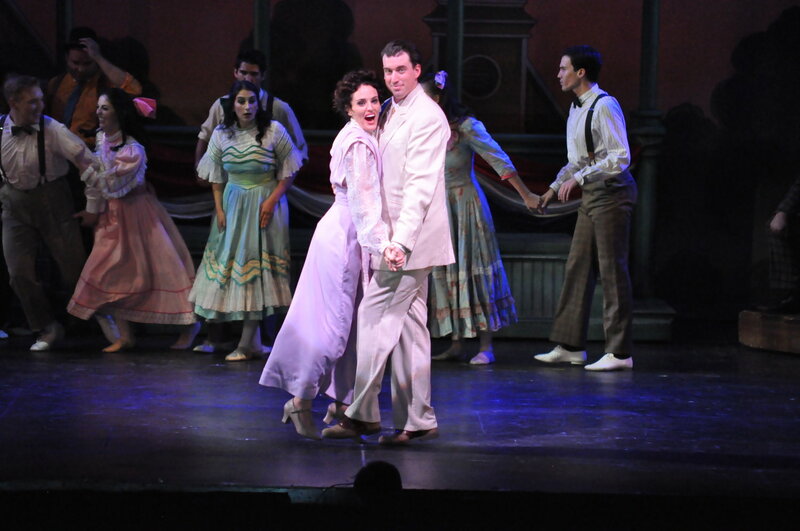 A classic musical with a cast and director that gives it the treatment it deserves. Hop on board, River City next stop!